Health Challenges? Low Energy? Excess Weight? Aches & Pains? Disease? Diminished Libido? or perhaps you're just seeking Peak Performance? Imagine your very own, completely personalized health-improving experience specifically designed so you will RE-CLAIM YOUR POWER while simultaneously learning how to balance your body and your mind! 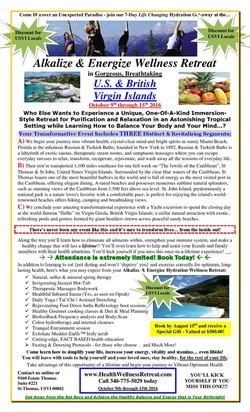 Come to the Caribbean and learn exactly how to eliminate all ailments within, strengthen your immune system, and make a healthy change that will last a lifetime!! You’ll even learn how to help and assist your friends and family members with their health situations. You’ll kick yourself if you miss this once in a lifetime experience! Participation is always limited! Your life-changing transformative Wellness Retreat will be conducted at a Tropical Resort setting in the renowned United States Virgin Islands, which sits nestled in the Gorgeous Caribbean Ocean area known as the “sailing capital of the world”. 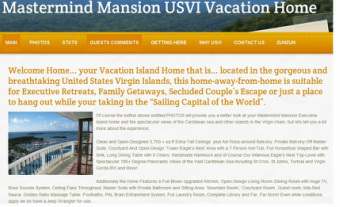 With white sand, blue skies, turquoise waters, peace, and tranquility, USVI are arguably the most beautiful and diverse of all the Caribbean Islands… Wait until your experience this place! You’ll never want to leave and will tell all your friends about your outrageous, fulfilling and health-boosting time in the islands! At your customized Health & Wellness Retreat enjoying private beaches, secluded coves, pristine coral reefs, untouched tropical frost, mountaintop views, island hopping and more. Your Resort Immersion-Style Detox Retreat location is magnificent and only minutes from the airport, marinas, ferry docks (to other islands) shops, and other hotels and restaurants and much, much more - right in our neighborhood! Come learn how to simplify your life, increase your energy, vitality and stamina… even your libido! You will leave with tools to help yourself and your loved ones, stay healthy, for the rest of your life. So, who Else Wants to Experience a Unique, One-Of-A-Kind Immersion-Style Health Retreat for Purification & Relaxation in an Astonishing Tropical Setting while Learning to Balance Your Body and Your Mind...? Get started today by downloading and completing your very own Health Assessment Questionnaire. This will allow us to determine what style of Retreat is best for you and your specific situation and what modalities you're going to need to gain maximum, vibrant health and vitality. Click on the orange Free button below to get started. Attendance is extremely limited! Book Today!